* Union Learning Update * After considerable team member interest and consulting with Coleg Gwent, we have an update on the essential skills courses. The Coleg Gwent team will be on site at DC2 on Wednesday 1st May for enrolment and then looking to start courses on Thursday 9th May. No times are confirmed as of yet but will be confirmed when arrangements are finalised. If any of our Retail team members have an interest in available ULR courses please contact our GMB Wales and Southwest Union Learner representative Helen Walley @ Helen.walley@wilko.com. Our Dc members are fighting to preserve a fair work/life balance of weekends off and a return to more family conciderate shift patterns. A happy employee is a productive employee! *DC INDICATIVE BALLOT UPDATE* We are now halfway through the balloting period in relation to the current rotas in the DCs. We would just like to remind all members who haven’t yet voted that the closing date is next Thursday, 18th April so please fill in your ballot paper and send back using the prepaid envelope provided. If you haven’t yet received your ballot paper, please inform us by the usual channels no later than close of play this Thursday, 11th April to give enough chance to check details and send a replacement if necessary while giving enough time for you to return your vote. Many thanks to all of you that have already returned your ballot, your support is greatly appreciated. * DC2 Update * Nicola Savage and Greg Hughes from our GMB Wales and South West Regional office will be onsite Thursday 4th April between 09:00am to 16:00pm in the main foyer. If you have the opportunity, please pop into the foyer to say hi and give your feedback and aspirations for the ongoing 2019 pay claim. Rumour has it they will be raiding our safely guarded freebie stash! *DC1 and DC 2 Update* We appreciate that you are waiting for feedback and understand your frustration but this has been delayed until Monday for reasons outside of our control. Thank you for your patience. 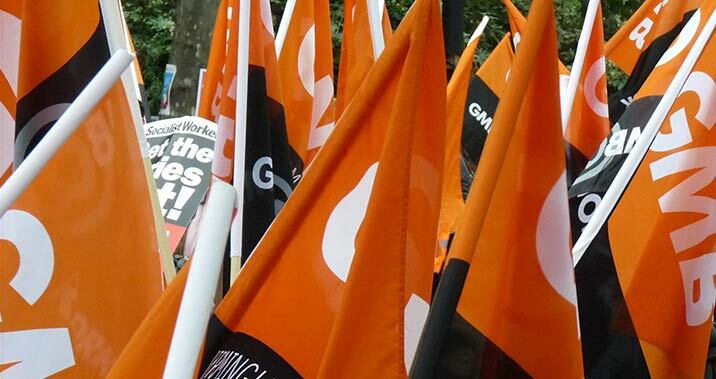 GMB @ DC2 STATEMENT – 7 DAY WORKING UPDATE 15th March 2019 As previously mentioned there was a meeting scheduled for yesterday, Thursday 14th March at Head Office where the agenda item ‘unreasonable work rotas/patterns’ was scheduled to be discussed. This meeting has now taken place and we would like to provide an update. GMB raised that the new interim rotas are causing a lot of upset, anger and frustration within both DC’s. This is due to the detrimental impact to work-life balance and the requirement to work a hugely increased amount of weekends which inevitably will lead to reduced family time and potentially have an impact on team members wellbeing. Following the meeting a number of items were discussed in relation to the number of Saturdays for 5/6 contracts, the number of weekends for 5/7 and the small frequency of two days off together. We are pleased to inform you that all of these items will be reviewed over the next 14 days to see if there are any changes that can be made. GMB have been clear that some movement is necessary on the above points. In addition, a further meeting has been scheduled for next week to further discuss what the future permanent working patterns may look like. GMB will reassess the situation as things develop and provide updates at the earliest opportunities. We would remind you that any post on Facebook, Twitter etc is subject to the Wilko social media policy and as such, we will take steps to protect our members and delete any offensive or aggressive comments. Please continue to support your GMB reps and continue to provide them with constructive feedback throughout this process so that we can make sure your voice is heard. GMB @ DC1 STATEMENT 8th March 2019 We would like to give an update following a recent post on our sister page, GMB W21 Branch. As expected, the new rotas are causing a lot of upset, anger and frustration within the DC and also with our colleagues at DC2. This is due to the detrimental impact to work-life balance and the requirement to work a hugely increased amount of weekends. Unfortunately, there are a lot of untruths being said both on the shop floor and on social media regarding the reps at DC1. Although we appreciate that emotions and feelings are high and it is very easy to lash out and blame GMB for the company’s actions, the reps are all unpaid volunteers and are working tirelessly and selflessly to support our members. It is worth remembering that every single one of the reps is subject to the same rotas and have their own personal issues too. Constructive criticism and feedback is of course welcomed, however abuse and personal attacks must stop. We would remind you that any post on Facebook, Twitter etc is subject to the Wilko social media policy and as such, we will take steps to protect our members and delete any offensive or aggressive comments. Once again, as previously stated in our notice last week, GMB have categorically not agreed, approved or authorised any of these interim rotas. As alluded to in the post referred to above, there is a meeting at Head Office on Thursday 14th March where amongst many other current issues, GMB (DC1) have placed on the agenda the item ‘unreasonable working rotas/patterns’. Following this meeting, there may be further options available, which GMB have relayed to the relevant Regional and National officers regarding the strong feeling for an indicative ballot and this may be considered following Thursday’s meeting. In the meantime, GMB do understand there is a lot of anger but please continue to support your GMB reps who are not in any way at fault. Please continue to provide them with constructive feedback throughout this process so that we can make sure your voice is heard. CONTRACT UPLIFTS In more positive news, GMB at DC1 can confirm we have negotiated an increase to full-time contracts for over 200 team members, along with a much-improved criteria to allow more eligible team members to gain more security in their hours. Eligible team members should be informed over the next week or two. * DC2 7 Day Working * Just to update as there has been a lot of en-queries, The flexible working panel are looking at the DC2 flexible working requests next week. There has been a slight delay due to members of the panel having pre booked holidays.